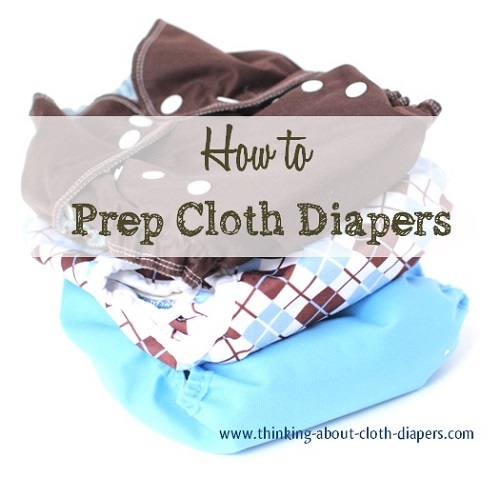 Preparing new cloth diapers is an easy but not-to-be missed first step! This article outlines everything you need to do to ensure the first time your baby wears cloth diapers is a leak-free success! It's easy to get caught up in the excitement when your first cloth diapers arrive. All diapers should be washed at least once before wear to remove any impurities, dirt, or even chemicals, that might be lingering from the fabric manufacturing and sewing process. Even cloth diapers that are made by work-at-home-moms (WAHMs) may have been exposed to pet hair, allergens, and dust! So when you are preparing your new cloth diapers, it just makes sense to give them (and all clothes!) a quick wash before use! Be sure to use a laundry detergent intended for cloth diapers to avoid residue build-up and other issues later on. 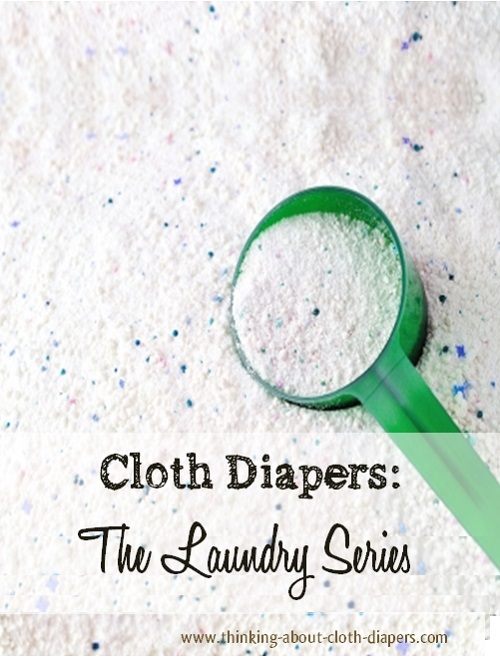 Our full article on cloth diaper detergents lists some of our favorite brands. When you buy used cloth diapers, you have the benefit of knowing that the fabrics are already "broken in" and will (likely) be fully absorbent. No matter what, used cloth diapers should still be washed to remove any dirt left from storage or packing! Unless you are confident of their history, you may also want to consider disinfecting them. Here are the directions for that. Stripping is not necessary. I usually recommend to start using them and see if you even need to. The steps for preparing your new cloth diapers depends on what material your diapers are made of. Natural fabrics require more preparation than synthetics, so it's best to wash them separately for at least the first wash. You can even do this right in with your clothes. Just don't use fabric softener. Why Do I Need to Wash Them Separately? Natural fabrics contain natural oils that are present until they are washed several times. Much as dish soap releases grease from your dishes, laundry detergents are designed to loosen up oils and dirt from fabric. Synthetic materials such as microfiber and microfleece, however, will pick up those oils and hold them tight, creating residues that impact the absorbency of your pockets and other inserts. This is why when you are preparing new cloth diapers that you need to wash natural fabrics separate from synthetics for at least one wash. Synthetic Fabrics (PUL, TPU, microfiber and fleece) do not require any special treatments before use, but of course they should be washed once before wear. This recommendation is typical for microfiber inserts, and pockets and covers made with PUL, TPU, and microfleece. We always suggest following your manufacturer's recommendations for washing, or read up on our basic washing routine recommendations here. New diapers made from synthetic fabrics (such as PUL diaper covers) can be washed with other diapers that have already been prepped right from the beginning. Many manufacturers suggest when preparing new cloth diapers that you toss PUL diapers in the dryer for at least the first laundry cycle to ensure that the PUL seals around the stitches and snaps, but others claim their diapers are waterproofed already. If you have diapers with hook and loop (Velcro) fasteners, be sure to close the laundry tabs before you wash them or they may stick together or snag other fabrics! If you have pockets or all-in-two diapers with natural inserts, you should separate them and wash them separately for at least 1 wash. Your pockets and shells are usually made from PUL and/or fleece, and these only need to be washed once before wear. The inserts, however, are a different story! Please note that while Wool is a natural fabric, it needs special care! Do not throw it in with your other diapers. You can read more about wool further down in this article. Natural fabrics should be washed on hot with the recommended amount of cloth diaper detergent, and then dried. While bamboo may be ready earlier, hemp and unbleached, organic cotton can take as many as 8 washes to reach their full absorbency. 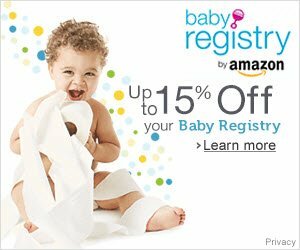 That's not to say you can't use your diapers sooner, but be aware that they may not provide their best performance before then! Natural fabrics also shrink the first few times that they are washed and dried, and manufacturers will account for this when they create their diapers. While some WAHMs pre-wash their fabrics, most manufacturers do not. As a result, your baby's diapers will also not fit properly until they have been prepped. NOTE: I was amazed at the transformation of my AMP hemp inserts and cotton prefolds - they shrunk considerably, and became puffy and much less stiff than they were brand new. And they really did take 6 to 8 washes to become quite absorbent. Preparing new cloth diapers really is an important step! And Repeat, 6 to 8 Times! Why Multiple Washes? Natural fabrics will require multiple washings to reach their full absorbency. The reason for this is that all natural fabrics contain naturally occurring oils that need to be washed out for your diapers to be fully absorbent. If you've ever added water to oil, you'll know that the "hydrophobic" nature of oils mean that the two don't mix. Natural fabrics with oils are no different - they simply can't absorb the water. 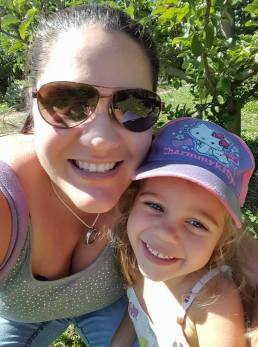 You'll need to remove the oils, or your diapers simply won't work well! Bleached fabrics may not require as many pre-washes to become absorbent as unbleached fabrics. How Can I Tell if My Diapers are Fully Prepped? There is no way to know for sure that your diapers are fully prepped. Washing them several times to remove the oils and soften up the fabric will definitely increase their ability to absorb. When I first tried out cloth diapers, I bought a second hand AMP hemp insert. I loved that insert so much that I later bought several more new. And even well-loved, the used one was much more absorbent than my new AMP hemp inserts for more than a dozen washes. So preparing new cloth diapers made of hemp can definitely take a lot of washes to reach its full absorbency! What if I Have Just 1 or 2 Diapers or Inserts to Prep? It can seem like a waste of water and energy to run multiple cycles to prep just a single diaper. You should take precautions to ensure that the oils don't transfer to your other diapers, or you will end up with a whole load that needs to be stripped, rather than just one diaper that needs to be prepped! Some moms will prep natural fiber inserts in a pot of boiling water on the stove. If you go this route be sure not to boil diapers that have snaps, PUL, or other materials, ONLY natural fibers such as inserts or prefolds. I haven't tried this myself, because this is a messy and time-consuming option that should only be used for 1 or two diapers or inserts! Another option is to add your natural fiber diapers to another load of clothing laundry for their first wash cycle. How Do I Prepare Wool Diapers? Wool care can seem a bit mysterious and even downright intimidating. But with a bit of extra care, wool can definitely be worth the extra time and effort! Wool diaper covers and any diapers containing wool in the shell or soaker need special care to ensure they don't stretch, tear, or shrink. Wool should NEVER be dried in your dryer, unless you're aiming for a doll diaper! And, unless the manufacturer tells you otherwise, wool should be hand washed in lukewarm water, using baby shampoo or a wool wash. Wool covers need to be lanolized before the first use to extend their lifespan and enhance performance too! 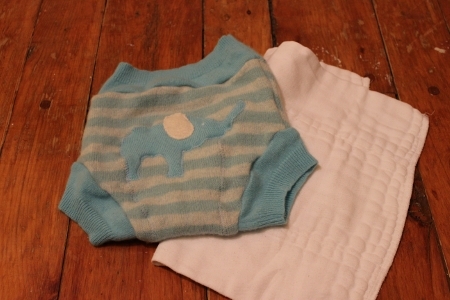 You can read more about wool diaper covers, including basics on wool care here. Preparing new cloth diapers before you use them is definitely worth the extra step. You'll feel much better knowing you can trust that they'll work the way they're supposed to, and that they fit too!